Sure, we pretty much already knew that Sega plans to release a PC port of Yakuza Kiwami 2 on Steam. The game has been rated for PC by the ESRB, after all. But now we have another clue: A logo change for Sega’s official Steam account. The account's new avatar is very clearly the eyepatch worn by Yakuza series side-star Goro Majima. How do we know this matters? Well, it’s been the way Sega has signaled this kind of thing for years now. A couple years ago, Sega released an 8-bit version of Bayonetta to tease the fact that the game was coming out, along with Vanquish, on Steam. 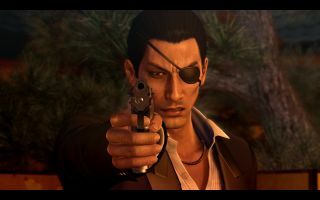 Now that Sega is using Majima’s eyepatch as its official Steam avatar, it seems pretty likely that a PC reveal of Yakuza Kiwami 2 is imminent. This seemed like a pretty certain thing already, given that the both Yakuza 0 and Kiwami have already landed on PC. But Sega likes to hype up these PC reissues, and they’re giving us a pretty clear indication now that the next Kiwami version of the Yakuza series is imminent. As far as we're concerned, bring 'em on, Sega.